Would you like to learn how to speak from your heart, dissolve fear instantly and stand on stage with unshakeable confidence? Do you want to know how to use the energy in the room to create greater impact and deeper healing and transformation? Are you interested in learning how to tell your story so every audience feels engaged, inspired and empowered to take action in their lives? Would you like to learn how to weave your book or product offer into your message in a way that doesn’t sound salesy? This training will provide a unique foundation of holistic speaking skills that will transform your ability to communicate from the inside out. Sue Dumais leaves no stone unturned as she challenges you to overcome all fears and obstacles allowing you to authentically share your message and touch the hearts of those who are meant to hear your voice. Whether you are a seasoned speaker or new and emerging this is a holistic experiential training designed for all speakers alike. Sue will privately mentor you offering individual coaching, instant feedback, online video sessions and training calls as well as intuitive healing sessions to remove any and all blocks related to your ability to speak, authentically share your message and touch the hearts of any audience. Everything will be recorded so you can access the material over and over again. NOTE: This is not for the faint of heart. We are going to go deep in a very short time. This unique program and the private mentoring is valued at well over $7000. So if you feel your heart YES and you are ready to receive the coaching you need to bring your speaking to a whole new level take the leap and register today! Start your Heart-Centered Speaker Journey now. Register today. Sue Dumais blends her gifts as an intuitive healer, heart led living coach, yoga teacher and international speaker to provide a transformational healing and training experience like no other. She has been trained and mentored by Les Brown, one of the top 5 speakers in the world, and she has spoken in front of audiences 10,000 strong with unshakeable confidence. 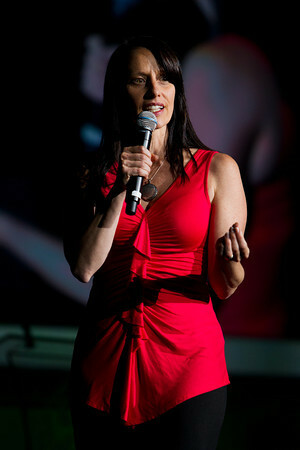 Sue has shared the stage with Dr Christiane Northrup, Dr Dennis Waitely, Marianne Williamson and Les Brown. She truly owns her power on stage and has been teaching, speaking and training for more than 20 years. She is passionate and excited to pour her heart into yours as she helps awaken the most effective, confident and powerful speaker you can be.